Note the chassis serial number and server part number. They are printed on a label located on the side of the chassis. Grasp the power supply handle and press the release latch. Slide the power supply out of the system. See the following figure. Remove the No. 2 Phillips screw securing the power supply backplane to the power supply bay. 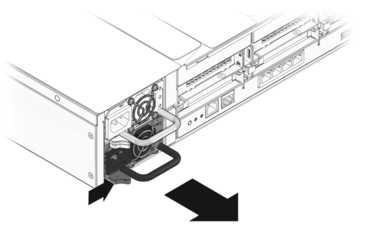 Lift the power supply backplane up and off its standoffs and out of the system. Place the power supply backplane on an antistatic mat.